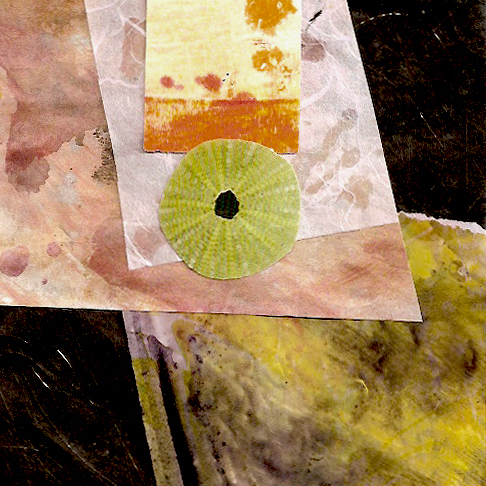 The Center of the Universe - Collage, 5x5"
The collage shown above is one more that I was able to get done this week. Collage makes me happy. My studio is warm and cozy, and makes me reluctant to venture outside on these cold days. Snow flurries today gave way to much colder temperatures later in the afternoon. It’s going to be down in the low twenties tonight. Therefore I was forced to go outside and once again put my covers on the broccoli beds. My fingers were frozen in just a few minutes! 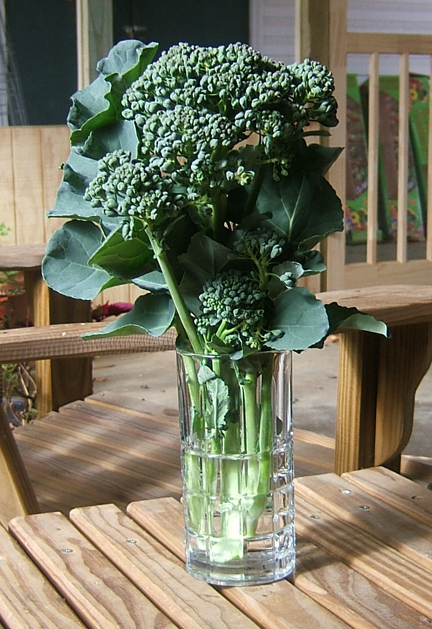 The broccoli is just now maturing perfectly. I was able to cut several heads and bring them in, but that leaves several more that aren’t quite ready. Just those beds alone will pay for themselves in home grown organic broccoli, Brussels sprouts, and a few cauliflower plants. This is a picture from last fall. The broccoli is just as beautiful this time. Here goes, coming from a long ago Vermont gardiner: Wait until the first real hard frost, then harvest broccoli, Brussels sprouts, cauliflower plants. Works like a charm and provides very sweet tasting crop; especially the brussels sprouts — can be bitter if cultivated too soon. I had a small metal hammer. I would run out to the garden after midnight when the temps were well below freezing, hit the frozen dirt, if I heard that magic ping from the hammer, time to cultivate. Of course, until that magic hard frost, had to go through several nights of covering the crop with sheets and/or blankets. Also had local Vermont farmer spread two-year old mule dung over the soil before turning ground in spring. Would get very large and sweet cauliflower heads; also very white (ya gotta keep the heads covered so the sun doesn’t oxidize them – brown spots and the like). Your post brought back some very fond memories of our life back in the 1970’s in northern Vermont. Thanks for the memory poke. Wow, thank you for that great advice, David. Little did I know I had a veteran gardener right here to call on for help. My garden is completely experimental just like my art. I had good luck with my broccoli last year, but every year is different in this area. This year I had put out my brassica seedlings at the normal time, Sept. 1st, but it was still too blazing hot and dry and they died. So we went out and bought more plants from our local nursery. Consequently I think my whole garden is a little late this time, with exception of the broccoli, which is doing nicely. The rest of them are small and might not make it unless I keep them warm for a whole lot longer. Fortunately we probably won’t have a hard freeze until after Christmas. My Brussels sprouts are the size of small peas right now and the cauliflower is tiny too. We’ll just have to see what happens. Yes, I knew about blanching the cauliflower. Mule dung. Need to go find myself a mule. I will, Myfanwy! Now you’ve piqued my curiosity.